Author(s): Pankaj K. Chaurasia, Shashi L. Bharati, Manisha Sharma, Sunil K. Singh, Rama S. S. Yadav, Sudha Yadava. Department of Chemistry, North Eastern Regional Institute of Scienec and Technology, Nirjuli -791109, Arunachal Pradesh, India. Fungal laccases are versatile enzymes. They have an ability to catalyze the oxidative reactions of different substrates like phenolic as well as non-phenolic. Since, laccase in laccase catalysed reaction, catalyses the four electron reduction of molecular oxygen and produces water molecule as by-product, it is highly promising enzyme for future industrial applications. Currently, extensive research has been conducted on the laccases world wide due to their unique roles in several biotechnological applications i.e. food industries, bioremediation, pulp, paper, textiles industries, selective biotransformations, oxidations of phenolic and nonphenolic structures, synthetic chemistry of carbohydrates, hormones synthesis and medicinal chemistry etc. In synthetic chemistry, they act as an important synthetic biocatalyst and there are neither need of drastic reaction conditions nor too cost. Such reactions do not cause any type of environmental or chemical pollutions like other conventional methods. 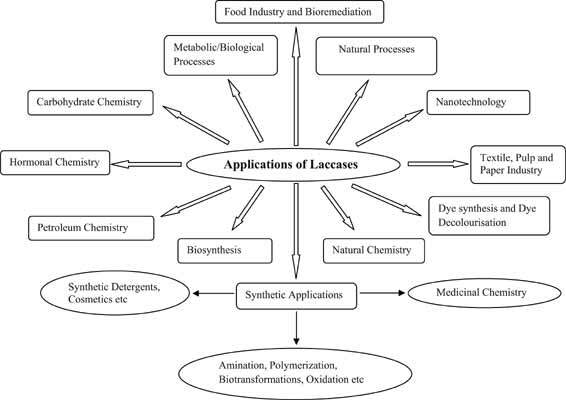 After the development of highly potential redox mediators, laccases become more advantageous for synthetic and other biotechnological applications because of the enhancement of the substrate range for laccases. The present review demonstrates the biotechnological importance of fungal laccases in the current perspectives along with short discussion on their properties and action mechanism. Keywords: Fungal laccases, lignins, wood rot fungi, biotechnology, mediators, immobilized laccases. Affiliation:Department of Chemistry, North Eastern Regional Institute of Scienec and Technology, Nirjuli -791109, Arunachal Pradesh, India. Keywords:Fungal laccases, lignins, wood rot fungi, biotechnology, mediators, immobilized laccases. Abstract:Fungal laccases are versatile enzymes. They have an ability to catalyze the oxidative reactions of different substrates like phenolic as well as non-phenolic. Since, laccase in laccase catalysed reaction, catalyses the four electron reduction of molecular oxygen and produces water molecule as by-product, it is highly promising enzyme for future industrial applications. Currently, extensive research has been conducted on the laccases world wide due to their unique roles in several biotechnological applications i.e. food industries, bioremediation, pulp, paper, textiles industries, selective biotransformations, oxidations of phenolic and nonphenolic structures, synthetic chemistry of carbohydrates, hormones synthesis and medicinal chemistry etc. In synthetic chemistry, they act as an important synthetic biocatalyst and there are neither need of drastic reaction conditions nor too cost. Such reactions do not cause any type of environmental or chemical pollutions like other conventional methods. After the development of highly potential redox mediators, laccases become more advantageous for synthetic and other biotechnological applications because of the enhancement of the substrate range for laccases. The present review demonstrates the biotechnological importance of fungal laccases in the current perspectives along with short discussion on their properties and action mechanism.